Colors great for a Southwest home. Love the teal and brown together. Nice lightweight coverlet. Nice quality. Bring the tranquil tones of nature into your home with the Macon 6-piece coverlet set from Copper Grove. With printed stripes in a rainbow of muted colors, this set features engaging geometric patterns that evoke a southwestern style. Say washable in 'cold water tumble dry no heat'. Shrunk 3 to 4 inches anyway. We purchased the Full/Queen size version of the Pine Canopy Macon Blue Coverlet Set for our guest room. The design as well as the color scheme fit our rustic Texas home perfectly in every way. The material is comfortable, and the colors are exactly as shown in the pictures. We really enjoy this quilted 6-piece Coverlet Set and get many complements from our guests. Thanks Overstock! 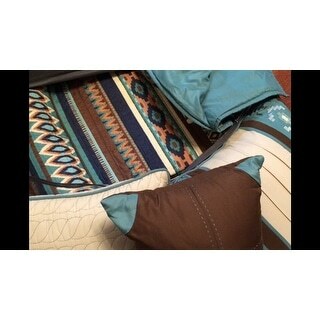 The coverlet, shams and coordinating decorative pillows are perfect! They look as pictured. I was so delighted to find a coverlet which included the decorative pillows which really make the ensemble. This is a very soft quilt that seems well made.it was plenty big for a king sized mattress. The throw pillows were very nice although a bit miss shaped due to packing- I'm sure they would have straightend out with some use or sitting under a heavy box for a day or 2. The colors are as pictured but it didn't go quite right in my room. I wanted to share my thoughts since there were no reviews. If the reverse side had been blue instead of teal I would have kept it. I will buy this brand again. 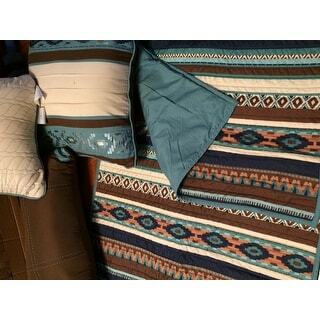 This was purchased to put on a full size bed in a guest room having a rustic slightly modern southwestern theme. I had already purchased a nailhead headboard and velvet drapes all from Overstock then went ahead I purchased this quilt set. It has been washed twice already after guests and the fabric feels and looks great! This can be used for all four seasons. For winter I have placed a quilted blanket underneath. Many compliments on this! The print is not too busy or overwhelming, it's just perfect!! Thanks Overstock!! I ordered a King size for a Queen bed so I would have the bedspread look which I like. Perfect fit except for the top of course, where I'll place all the pillows and shams. The whole set seems to be great quality and I love the feel of the material. I would have rated it 5 stars if not for the color. IT IS more teal or turquoise, not blue. I would advise not for a small room as it is.......wild. Excellent price, hold out for a coupon! I absolutely LOVE this quilted set for our master bedroom! The colors are just as vibrant as the display picture shows and blends perfectly with the rest of the bedroom decor. This set will last for years with the quality of the materials used. I've washed it now 4 times without it loosing its shape or color. And the detail on the throw pillows is beautiful! This set will last for years to come! 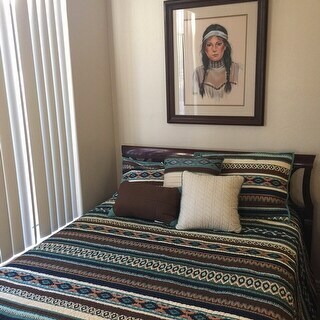 I searched high and low for a lightweight, Native American-inspired coverlet to replace my heavy comforter during warm weather. 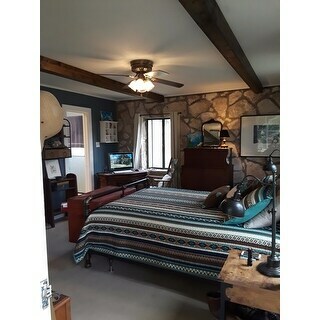 This set gave me everything I wanted, plus accent pillows, for a GREAT price. I was worried because it's polyester, but it looks and feels like cotton. I couldn't be more pleased. 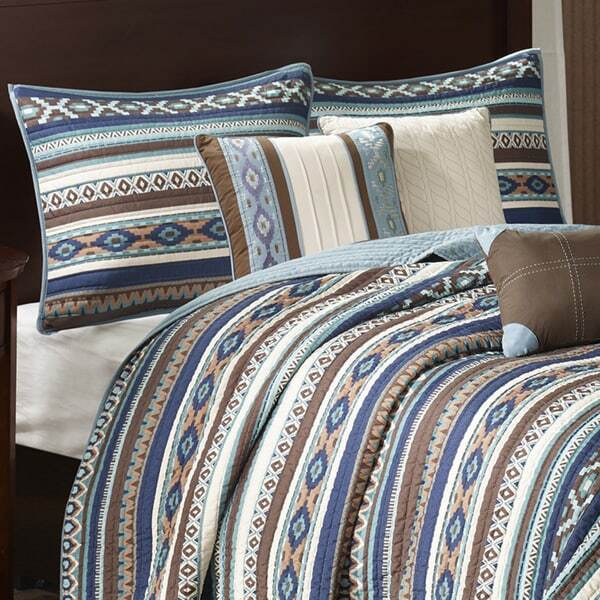 This coverlet set has beautiful colors consisting of teal, brown, salmon, navy, and cream. Very soft to the touch. Not extremely heavy. A few creases on ornamentation of throw pillows, which pressed out easily. Definitely would recommend. I was looking for something not "girly" and not "too country". Found a match! If you are expecting blue, don't be surprised when it is green on the underside. I would have ranked it higher, but the color is not even close to the picture. Nice quality, but the colors are not as shown. Beautiful colors, which are true to the picture. Generous size which covers bedding. This light-weight quilted coverlet stands up to machine washing and drying very well. I love this set. And.... it has held up beautifully. My dog and grandkids have tested it's limits and it washes very well. I agree with other's comments. It is more turquoise than blue. Love the color though! Good quality find! Everything looks great! Can't wait to put it on our bed!! Beautiful, more so in person. Good Value! "does it have a greenish tint to it, or is it a true blue." I see no green in mine. This is a rich jewel tone blue. Love the colors and that it's available in California King. That size can be very difficult to find. Also liked that it machine washable. I love the colors, it's what I've been looking for. Hoping that I love it when I get it. It matches my Southwest decor perfectly. I am putting it in a guest room with two beds and want the bedding to match. I previously ordered this and was very happy with the quality of the items in the coverlet set.